It was booting over and over when we saw it. Whoops. There is another glitch: the displays above the central stairwell at Richmond have a list of the next few direct Flinders Street and City Loop trains, for people changing trains. Unfortunately they display V/Line trains on them, which suburban passengers can’t use. Hopefully that’ll be fixed soon. Next → Next post: Myki – confusion reigns! I’ve seen Myki readers at stations rebooting over and over like this also. 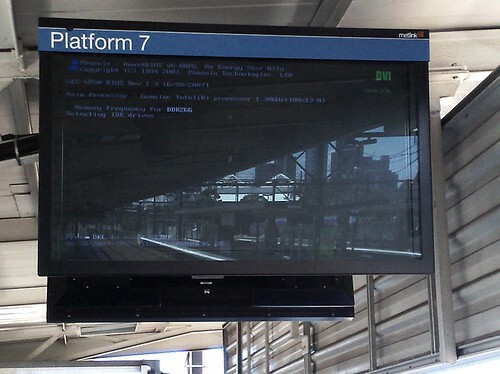 There are similar screens at the Metropolitan plaforms at Southern Cross, however instead of having one set of screens for each platform, there is only one screen shared between two platforms. Having two lines (eg Epping and Lilydale) on the one screen means they are very squashed and hard to read. Why did Richmond get one screen for each platform, but Southern Cross, one of our biggest station, only gets one? Just makes it all the more confusing for people coming from the country and switching to a suburban line. Assuming they don’t miss their connection getting from the Vline platfrom to the Metro platform like we often do when coming back from Lara. I think in general the clocks still work, at least at Richmond, but that one obviously wasn’t on that day. I agree with Nathan, the screens at Southern Cross are so small you practically have to be right under them to read them. My other pet hate at Southern Cross is that when the screen is showing the next train that will be arriving, at the bottom of the screen it no longer shows the subsequent train after that. I know it flips between the next train and all other following trains, but when it’s showing the current train, I still want to see the next one, ie. should I get this one cos the next one has been cancelled? And at the Collins street entrance, the screens used to be above the ticket office, so you could walk past outside the station and still be able to see when your next train was coming (ie. was there time for a beer at Loco? ), but now they have moved the screens off to the side so you must enter the station to view them. 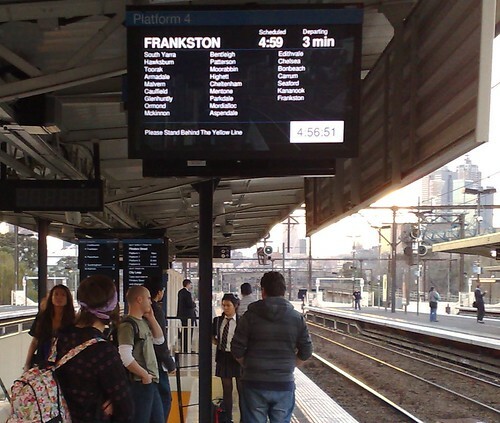 What I would really like is a summary screen for Central Station, OUTSIDE the building eg on Swanston St. Not gonna happen, but it would be SO much more useful in deciding whether or not to catch the tram or the train, especially late at night. …and how about one that you can see BEFORE you’re actually on the train when you’re coming from Elizbath Street to Platform 12/13? aaaah…one of my pet hates…. – they decided to have one less set of screens, meaning I have to walk further to a screen to read it. – they still haven’t put any screens at the Richmond end of platforms, where almost half of the platform is. – screen placement is stupid, from Elizabeth St ramps you get reflections from the lights, they are not near the stairs from DeGraves St. Subway. – being stingy on screens here is ridiculous. Why aren’t the screens near escalators ? – as mentioned by Liz, why are the screens shared? I’ve got no hope at this station. And the acoustics are so bad the platform announcements (when they happen) are often useless as well.